← Traditional vs. Crowdsourced Election Monitoring: Which Has More Impact? Widespread and heavy rains resulting from Typhoon Haikui have flooded the Philippine capital Manila. Over 800,000 have been affected by the flooding and some 250,000 have been relocated to evacuation centers. Given the gravity of the situation, “some resourceful Filipinos put up an online spreadsheet where concerned citizens can list down places where help is most urgently needed” (1). Meanwhile, Google’s Crisis Response Team has launched this resource page which includes links to News updates, Emergency contact information, Person Finder and this shelter map. 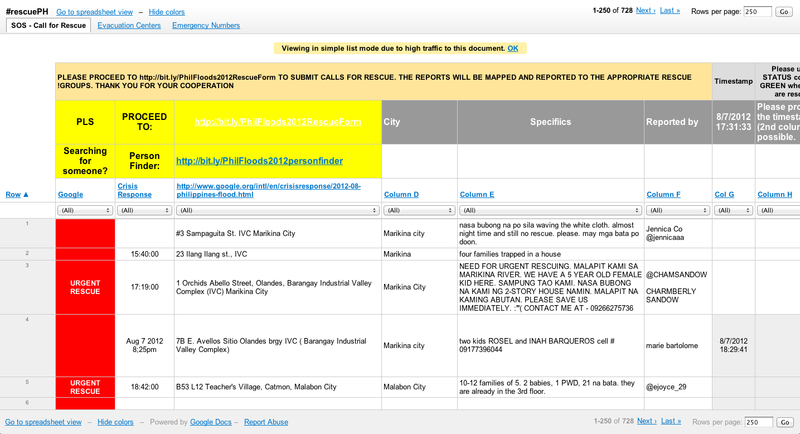 Filipinos volunteers are using an open (but not editable) Google Spreadsheet and crowdsourcing reports using this Google Form to collect urgent reports on needs. The spreadsheet (please click the screenshot below to enlarge) includes time of incident, location (physical address), a description of the alert (many include personal names and phone numbers) and the person it was reported by. Additional fields include status of the alert, the urgency of this alert and whether action has been taken. The latter is also color coded. “The spreadsheet can easily be referenced by any rescue group that can access the web, and is constantly updated by volunteers real-time” (2). This reminds me a lot of the Google Spreadsheets we used following the Haiti Earthquake of 2010. The Standby Volunteer Task Force (SBTF) continues to use Google Spreadsheets in similar aways but for the purposes of media monitoring and these are typically not made public. What is noteworthy about these important volunteer efforts in the Philippines is that the spreadsheet was made completely public in order to crowdsource the response. As I’ve noted before, emergency management professionals cannot be every-where at the same time, but the crowd is always there. The tradeoff with the use of open data to crowdsource crisis response is obviously privacy and data protection. Volunteers may therefore want to let those filling out the Google Form know that any information they provide will or may be made public. I would also recommend that they create an “About Us” or “Who We Are” link to cultivate a sense of trust with the initiative. Finally, crowdsourcing offers-for-help may facilitate the “matchmaking” of needs and available resources. I would give the same advice to volunteers who recently setup this Crowdmap of the floods. I would also suggest they set up their own Standby Volunteer Task Force (SBTF) in order to deploy again in the future. 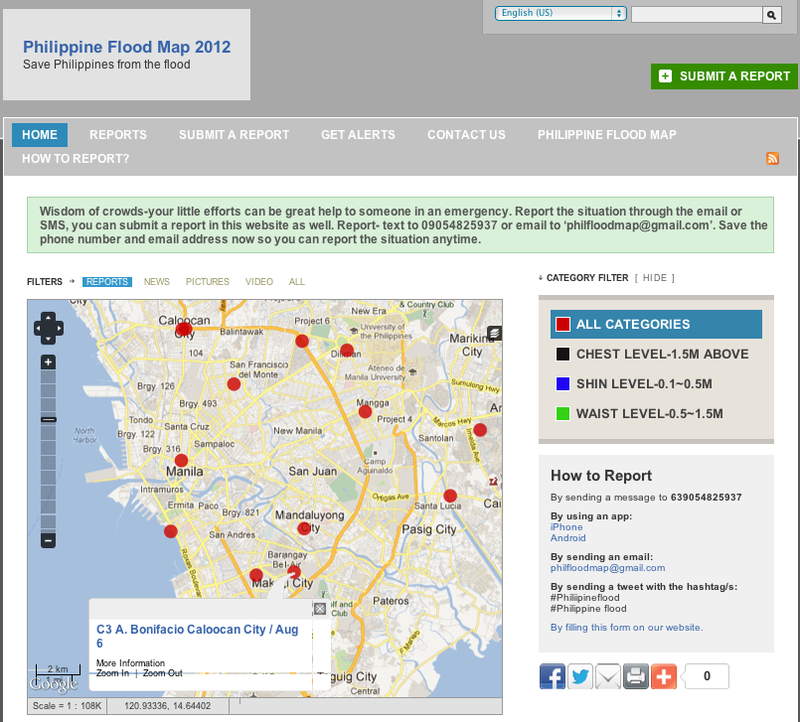 In the meantime, reports on flood levels can be submitted to the crisis map via webform, email and SMS. This entry was posted in Crisis Mapping, Crowdsourcing, Social Media and tagged flooding, floods, Google, Manila, Philippines, Spreadsheet, Volunteers. Bookmark the permalink. Thanks for the post, Patrick. Yesterday, I contacted the Philippine Crowdmap team to make some recommendations about outreach and content collection. Thank you, Patrick! I am collecting pertinent links and posting on Info4Disasters quick link page. For anyone interested, here is the link. http://bit.ly/FloodsPH Thank you for your great posts!